The BrightBox is a portable solar home system that has the all-in-one capability of powering up to 4 lights, multiple mobile phones, tablets, radios, and low-powered USB devices. Easy maintenance that allows long-term access to solar power is also a priority. 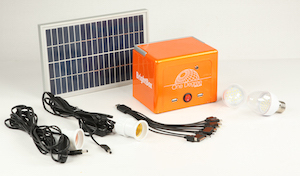 Unique from most solar products, BrightBox was built with an open-hardware design ensuring added compatibility with most 12V DC bulbs and standard motorbike batteries available in many local markets. BrightBox also comes with a 1-year warranty combined with One Degree Solar's free support via SMS, phone, and email. BrightBox is currently the brightest Lighting Africa approved product.